Download 2017 holiday coupons here! For Thanksgiving and the December holidays, please consider sharing a dinner with someone who might not otherwise get one. 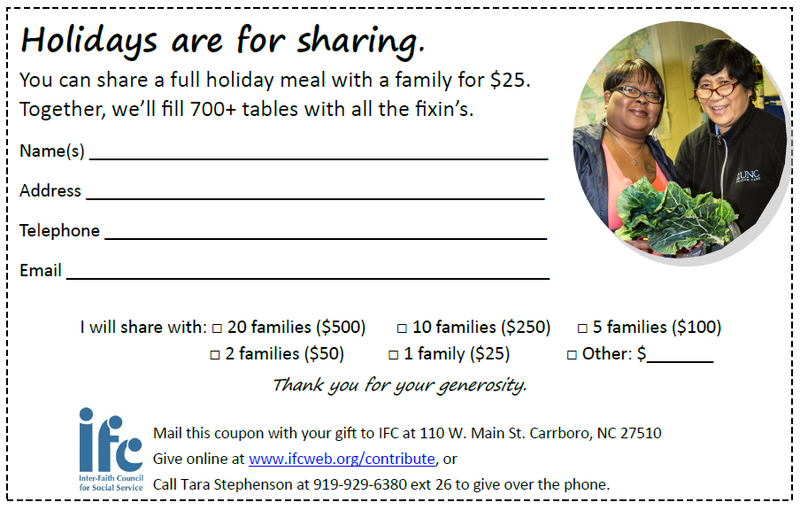 A gift of $25 helps the IFC offer a family a holiday dinner-- a turkey or ham, mashed potatoes, stuffing, vegetables, bread and dessert. This year, IFC will provide holiday dinners to at least 700 families, an effort which requires community collaboration. With help from local congregations and community volunteers, bags of non-perishable food items (e.g., instant potatoes, gravy mix, cranberry sauce) are assembled in advance. As the clients arrive to pick up their dinners, frozen turkeys or hams and other perishable food (e.g. fresh produce thanks to a special collaboration with Farmer Foodshare). Special arrangements are made to provide meals to shut-ins. On the evening of the last distribution day, people who did not sign up in time can come and see if there is any extra food, which is distributed on a first-come, first-served basis. The holiday season is one of the happiest times of the year at the IFC and these meals make a huge difference in the lives of people right here in our local community. We'll be glad to help you pay by credit card! Call 919-929-6380 x 26 and speak to Tara.